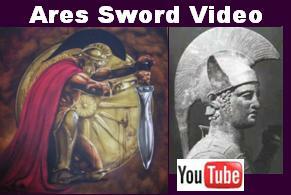 Handmade Ancient Areas Xiphos Lakonian Sword. Influenced by the Greek God of War, Ares. Fully Functional. Made by Scorpion Swords & Knives from Quality Heat Treated Steel. See Pictures, Prices, and Descriptions. ARES (Arês), the God of War and one of the great Olympian gods of the Greeks. Ares was the son of Zeus and Hera. Ares loved war for its own sake, and delighted in the din and roar of battles. Ares represented war conducted "up close and personal", hand to hand combat, and the frenzy of battle and bloodlust. Zeus, favored "war at a distance", strategic planning, playing according to the "rules of the game", cold and calculating by comparison. Ares style was instinctual, passionate, and primitive...not destined to make him appear heroic. He was seen by the ancient Greeks as a mercenary warrior. Total Length = 26 " Blade Length = 19 ¼ "
Blade Width = 3 ¼ " Blade Thickness = 3/16 "
Handle Length = 6 ¾ " Handle Width = 1 ¼ x ¾ "
Weight = 3 lb 4 oz Handmade Leather Sheath.